I am looking at doing some fairly in-depth research about Jim Gordon and would like a few pointers to where to find interviews and the like prior to his internment. I have the Rolling Stone article from 1985 which deals with his mental decline, but would like to find material from his hey day as a world class drummer. Any help would be most appreciated. I know he ended up as the Gotham City police commissioner. Can't remember the author off of the top of my head... but there was just a book released about "the Wrecking Crew" and their was an entire chapter devoted to Gordon... much of which talked about his actual work in the studio. Might be a good starting point. "You wanna have the '409' sound, right? On 'Help Me, Rhonda'?" "Honkin' down the gosh-darned highway..."
"Cried so hard...teardrops on my bed...COME ON MUTHAF*****S!" Yipes. Derek and the Gallows. Thanks for the book tip. It is ordered and will be in my hands tomorrow. Looking forward to reading it. 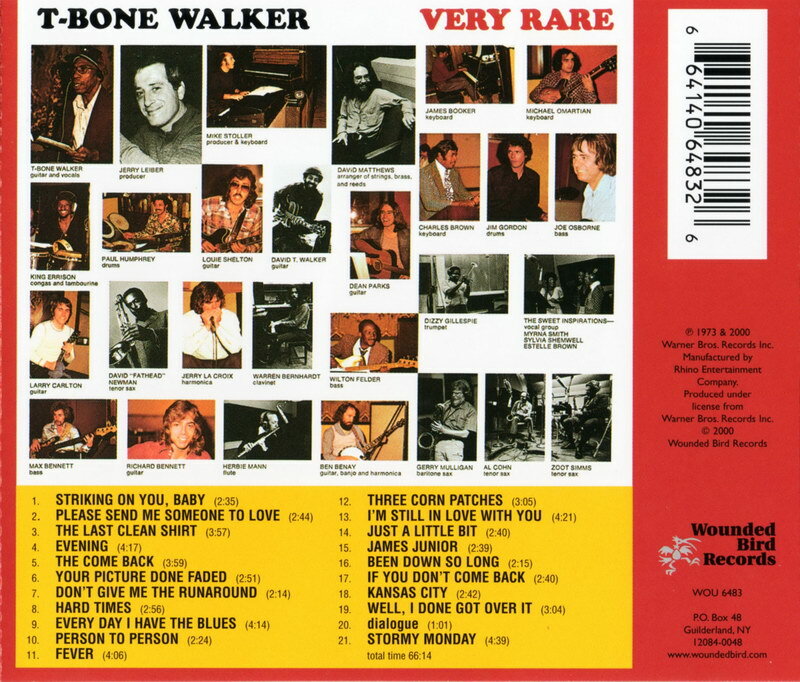 I just realized while listening to the Leiber&Stoller produced "Very rare" album by T-Bone Walker, that Jim Gordon plays drums on said album. There's a picture of all the players in the booklet. The album is from 1973. Fantastic album, btw. Check it out. I believe it was T-Bone's last or next to last record. I wasn't aware that he played on Surfin Safari. On which tracks can he be heard? That is quite an all-star lineup of session legends on that album! It kind of backs up the notion that at this time in history, you could literally make some calls and hire these guys - Not as big of a deal as I think some might think it was in retrospect, given the weight of some of those musicians in modern times. But yes - If you had the money, and if they were available and willing to play the session, you could book them. Interesting aside - Check out T-Bone's 50's sessions from LA too, most released on Atlantic's "T-Bone Blues" lp. He has some similarly heavy hitter session cats on his tracks, the original LA "Wrecking Crew" before there was a Wrecking Crew, including both Plas and Ray Johnson, Earl Palmer, and Barney Kessel playing some very unexpected instruments. Cool stuff. Jim Gordon is one of my absolute all-time favorite drummers. Hands-down, one of the best groove players of that era. Amazing and tragic. Never mind session legends, what about just plain legends? Dizzy Gillespie? One of the greatest trumpet players of all time (I would argue the greatest, but that's just me). Gerry Mulligan isn't too shabby either. I have to check out that album! Do that! Leiber & Stoller know how to produc this stuff and the musicians obviously know how to play. You even will hear an electric sitar on one song. Through and through a beautiful alum. Fun fact: It was obviously this album that Elvis Presley (who had the Sweet Inspirations on backup in studio and on stage) listened to around his "Raised on Rock" album from the same year (recorded at Stax), as he covered three of the songs appearing on this album and using the same arrangements. Unfortunately said album is nothing I would recommend listening to (except more or less one standout song) as he was up to his head full of pills and sounds like he was falling asleep at any second. Powered by SMF 1.1.21 | SMF © 2015, Simple Machines Page created in 0.19 seconds with 21 queries.